Specifically the Paris level, as Sapienza isn’t out until later this month. Hitman is receiving a bit of a drubbing in its Steam reviews. It seems people are upset about the fact that its online and offline play modes are segregated, with different saves for each and a game system that will somewhat over-zealously yank you back into the menu whenever you lose connection. And I can definitely see how this would be annoying if you have a poor connection, although it’s not like Hitman takes the infinitely-worse step of forbidding offline play entirely. 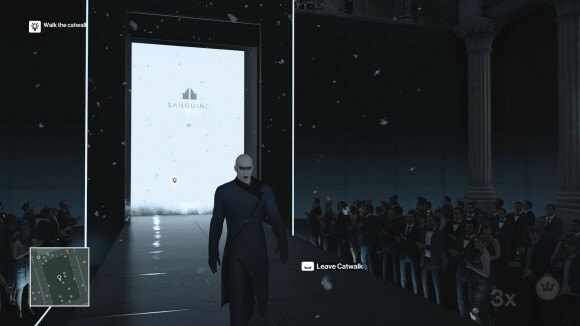 People also seem to be a little upset about this new Hitman’s episodic structure whereby it’s been split up into chunks of game consisting (essentially) of a single level; this first episode consists of two training levels plus the Paris Showstopper mission, and has no doubt been shoved online in order to fund the development of subsequent episodes. I’m a little less empathetic about this complaint, however; since each Hitman level is entirely standalone an episodic structure could definitely work, and so all it has to do to succeed in my book is to provide enough content per episode to justify the asking price. So: is episode one of Hitman worth £12? Well, first I should mention that the two training missions packaged in with the Paris main event are actually surprisingly meaty experiences in and of themselves. While not on the scale of Paris, a lot of work has clearly gone into making them fully fleshed-out mini-scenarios that can be enjoyed with the tutorial hints turned off – which is exactly what the game does after you complete them for the first time, sending you back into the first training mission with no breadcrumbs and a broad mission directive to assassinate the target however you like. Even here, in a level that consists of a single mocked-up yacht, there’s three or four different ways of disposing of the target that aren’t just killing him with a different weapon: you can poison his drink and ambush him in the bathroom; pose as his contact and wait until his back is turned; or just drop a lifeboat on his head. The second training mission expands things a little; now you’re infiltrating a mocked-up Soviet installation to kill a defecting spy – and there’s even more variety here, culminating in tricking the target into doing a “test” of the ejection mechanism in a MiG fighter jet when you’ve secretly turned it live. There’s so much packed into them that these training missions can’t be dismissed as just tutorials, and you can derive several hours of enjoyment just from those if you so choose. Still, they are ultimately just a bonus. What you’re buying this first episode for is the Showstopper mission, where Agent 47 attends a fashion show in a Parisian mansion with the intention of murdering the owners (who are apparently very bad people). 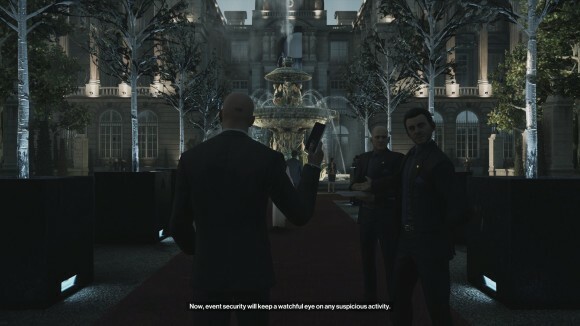 The mansion is huge – each training mission could probably fit inside it a dozen times over — and it is absolutely crawling with both civilian NPCs and security guards. The difficulty levels and Silent Assassin ratings from previous Hitman games are absent from this one; now there is just one default difficulty setting whereby Agent 47 will expire very, very quickly if he fights more than one guard at a time, and given that there’s about 80 of them in the level — and that it is nigh-impossible to take them out quietly without at least a civilian noticing and raising the alarm — the game is dropping some very heavy hints that indiscriminate violence is not a viable solution here. 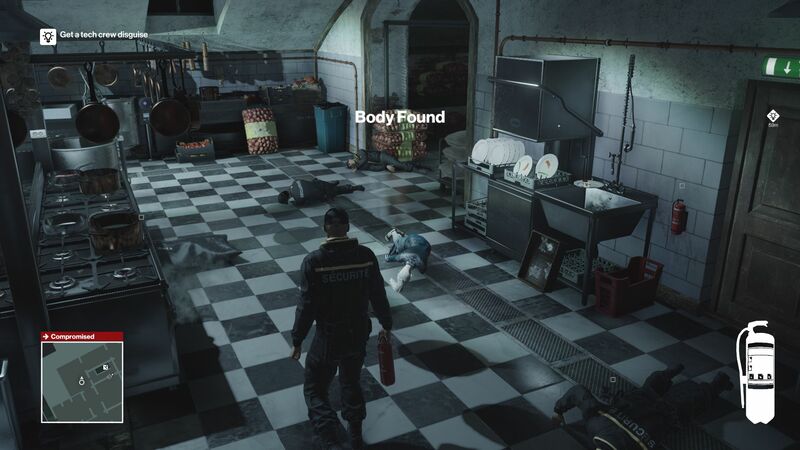 Previous Hitman games dissuaded it but always left it open as a last resort; here it’s pretty much impossible to just shoot your way in unless you’re prepared to spend a couple of hours painstakingly exploiting the guard AI. 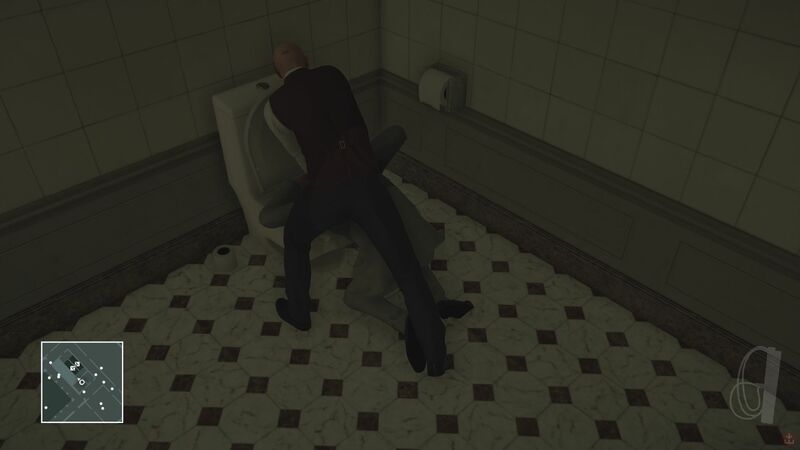 No, in Hitman you have to use your noggin to get anywhere. Hitman levels have always been these quite elaborate puzzle boxes where you tried to figure out the best way of killing to your target, and the Paris mansion takes that idea and ups the scale dramatically. You have two targets: Victor Novikov, who tours the ground floor of the mansion hobnobbing with the guests, and Dalia Margolis, who is hosting a clandestine auction on the heavily locked-down second floor. Killing Victor is as easy as walking in the front door and shooting him in the head — but you wouldn’t survive for more than five seconds after that as his security gunned you down. And even if you survived you’d still have to get to Dalia, who is by far the trickiest of the two to eliminate. 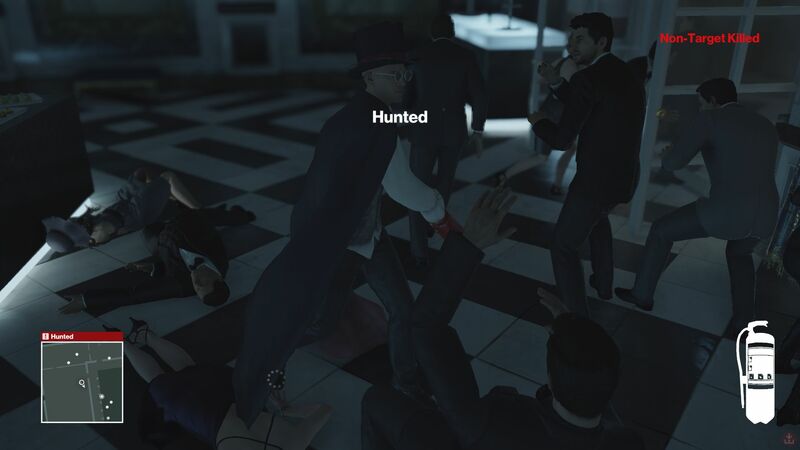 In order to get both of them and get out alive you have to shamelessly abuse that old Hitman staple of knocking out unsuspecting NPCs and stealing their clothes; this will allow you access to areas of the mansion that would otherwise be off-limits, which in turn lets you either engineer background events so that you end up alone with one of your targets, or else arrange an outstandingly elaborate environmental deaths for them, such as dropping the catwalk lighting rig on their head. You’re aided in this by Hitman’s Opportunities feature. As you wander around the mansion you’ll occasionally see a little lightbulb marker, usually hovering over a group of NPCs having a conversation. This marks the beginning of a trail of breadcrumbs you can follow to set up a particular mode of expiry for one of your targets. Probably the most obvious one is poisoning Victor’s favourite cocktail with an emetic, following him to the bathroom and then drowning him in the toilet; for this you’ll need to find the cocktail recipe first. For Dalia, the easiest solution is to knock out and impersonate a male supermodel (who has a conveniently uncanny resemblance to 47) so that you can get a private audience with her, and then poisoning her drink with cyanide. Despite the size of the mansion it doesn’t take long to figure out and execute either of these plans, meaning your first run of the level won’t last much longer than 25 minutes. And if Hitman were just about killing the targets that’s where this review would end and I’d say it wasn’t worth the money. Fortunately the series has never been about that, however; it’s always been about replaying levels until you get an outcome that you find satisfactory, and Paris has that replayability factor turned up to 11. Paris and both of the training missions have a series of challenges associated with them. Some of these are based around exploration and discovery, but the most interesting ones state that you must kill you targets in a certain way, which serves to advertise the vast array of solutions to the Paris puzzle that are available. I’ve killed Victor by drowning him in a toilet, pushing him into the Seine and dropping the catwalk lights on top of him, but there’s also an opportunity to lure him outside with fireworks before sniping him from a nearby piledriver boat-thing, as well as one for assassinating him with explosives planted inside a camera while he gives an interview. I know this because there are challenges for them. For Dalia there appears to be a ridiculously comprehensive range of options for infiltrating the auction she’s running and arranging her death that way – my method of just poisoning her drink while her back was turned starts to seem positively gauche by comparison. The interesting thing here is that while many of these challenges are also advertised in the level by the Opportunities breadcrumbs some of them are more difficult to access than others, or require a certain amount of preparation and forethought to execute. This is where the Mastery metagame comes in; each main level in Hitman has a Mastery level associated with it, which is raised by completing challenges inside that level. A higher mastery means more options are available to you when starting a mission – you can choose to start undercover in a different spawn point, or have items smuggled into the mansion that’ll make accessing subsequent challenges easier. By tying the assassination challenges and the Mastery metagame together in this way Hitman hopes to ensure that you’ll keep replaying the level until you’ve seen everything it has to offer, as completing challenges to raise that Mastery to its max level demands that you come up with a ludicrously varied range of assassination methods. If you bought into it I can easily see the Paris level occupying a dozen or more hours of your time; it is huge compared to previous Hitman games and has the breadth of options to match, if perhaps not the depth. I didn’t, unfortunately, but that’s okay; I still very much enjoyed going after the challenges for their own sake even if I’m not going to obsessively clean up all of them, and there’s still a couple of interesting-sounding ones I intend to go back and do. The simple act of sneaking around is still as fun as ever, and you could easily take up an hour or two just exploring the mansion and scoping out all of the opportunities available; if you get spotted it’ll often end in a dead Agent 47 and a reloaded save, but the panicked chase sequences that ensue beforehand are a thing of pure joy, especially since 47 now has an amazing over-the-head throwing animation for whatever he’s carrying — kitchen knives, busts, fire extinguishers, it doesn’t matter what it is, he’ll happily hoof it at the enemy in such a way that it’s guaranteed to make contact with their head. I haven’t enjoyed throwing fire axes at people this much since Dead Island. Before I finish I should mention Hitman’s voice acting. Hitman’s voice acting is verrrry interesting. Technically speaking it is perhaps not of the highest quality, but I think that in some respects that is absolutely intentional; you can hear the self-aware, self-deprecating tone of Blood Money in every other line that comes out of an NPC’s mouth. And bloody hell there are a lot of lines. Like everything else about it, there is a massive quantity and variety of background dialogue to be found in Hitman, from scene-setting to exposition to simple conversations between otherwise incidental characters that fill out the world. All of the reaction lines to whatever disguise Agent 47 is wearing at the moment are comedy gold, as well as the guard dialogue when they spot you doing something you shouldn’t (such as strangling somebody) or when you’re being hunted and they send out a description of whatever the last disguise you were wearing was. What particularly impressed me was how reactive it was — if, like me, you become addicted to throwing the fire extinguisher at people (it connects with an incredibly satisfying, frying pan-like *CLONG* noise) then it’s likely the next time you see a guard what comes out of his mouth will be something along the lines of “DON’T YOU THROW THAT–” before being suddenly cut off by another *CLONG*. NPCs will also react to however you carry out the mission; there was a nice bit where, just after disposing of Dalia, I was lining up a shot on Victor as he strode out onto the catwalk – but before he did he got a phone call informing him of Dalia’s death by cyanide poisoning, which I thought was a great touch. I’m sure there’s a hefty amount of scripting underlying all of these experiences, but Hitman does a good job of keeping the bulk of it invisible and making itself seem as much of a sandbox environment as possible, albeit one that’s perhaps a little too concerned with what the the player character is doing at any given time. It only breaks when you actively go out of your way to break it; otherwise it provides an experience that’s more or less on par with the best of Blood Money. It doesn’t have the strength of Blood Money’s metagame, with its verbal rating of your actions and a cunning newspaper report of the killing that would contain more or less detail depending on how noisy you were, and so aside from the sheer scope of the Paris mansion there’s little to keep you playing long-term — but then at £12 this was never supposed to be a long-term investment. As a bite-size chunk of Hitman goodness this first episode of Hitman works wonderfully. It’s episodic content done right — I think it benefits particularly because you have time to savour an individual level before moving on to the next — and a great advert for the series to come. I can’t wait for the next one. Yes, pleasantly surprised here, it’s pretty great – not quiiiite Blood Money level, but close. Hopefully the other levels will be up to the same standard. Also fair play to them in that there’s an “upgrade pack” for those who dipped into the first episode because they weren’t sure, but then want to go for the season pass without paying full price. Works out a smidge more expensive than getting the season pass upfront, but not unreasonably so. Have you played the remaining episodes as yet? I have just completed Sapienza, which I think is probably even better.